16 ounces of German Fatcap! - Modist Brewing Co.
16 ounces of German Fatcap! MODIST BREWING CO. 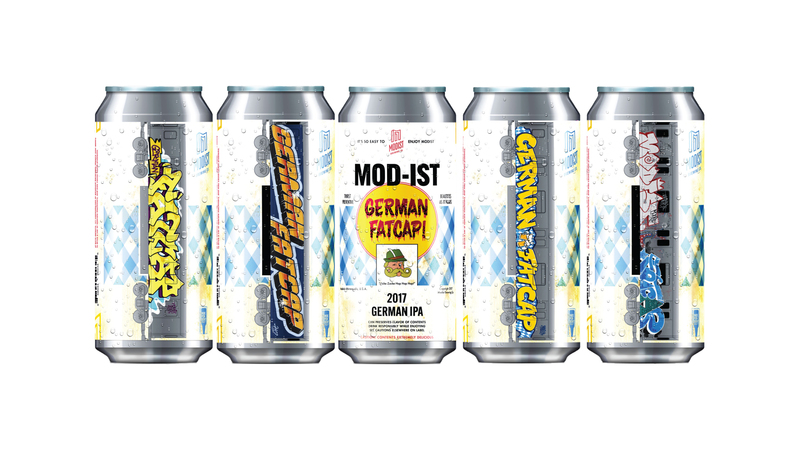 ANNOUNCES LAUNCH OF GERMAN FATCAP, A GERMAN IPA, INTO 16 OZ CANS. EACH 4 PACK WILL FEATURE 4 UNIQUE CAN DESIGNS. German Fatcap – our super limited, super seasonal, German IPA – will be hitting select liquor store shelves on Wednesday, September 6th. Named after a type of spraypaint nozzle, the artwork on the can’s front pays tribute to the classic design of American spraypaint cans – while the artwork on the back features 4 distinctly different rail cars covered with different subway art styles. The beer will also be available to try in our taproom beginning Tuesday, September 5th. German Fatcap takes its name from a certain type of spraypaint nozzle (colloquially known as caps), which gained popularity in the graffiti world for their ability to quickly unload large amounts of paint in a clean circle the size of a basketball. German Fatcap’s artwork is a tribute to both the designs of classic American spraypaint cans and the artists who used them. Burlesque of North America‘s Wes Winship and Mike Davis created this sharp tribute with four distinct back designs featuring four distinct styles of subway art over the outline of an R142 car from the IRT division of the New York City Subway. German Fatcap is our answer to an Octoberfest beer. A crispy malty festbier brewed with a German water profile, German malts, German hops, and German yeast – then aggresively hopped like an American IPA. Its bold hop character balances the rich malt backbone to create thick a FAT CAP of aromatic foam.